Mark Nowakowski, VP of Sales, is explaining the new possibilities with the CenTrak RTLS. The theme for the 2011 Cerner Health Conference was “Experience the Possible”. The goal of the theme was to “shift discussion away from hypothetical theories, complex acronyms and abstract ideas, instead focusing on what passion, collaboration and innovation have made possible in healthcare today and for the future.” That’s something at CenTrak we’re really passionate about too — RTLS dreams are now realities with CenTrak technology. The conference was a great showcase for the work we’ve already done in healthcare; there are now more than 300,000 tags installed in healthcare provider facilities worldwide. Traffic was heavy as attendance (with more than 10,000 people!) and interest in RTLS were at all-time highs. Visitors to our booth were impressed with CenTrak’s patented Gen 2 Infrared (IR). This new generation of infrared ensures triggers based on the location of patient, staff, caregiver or equipment in specific rooms are executed reliably without false reads in adjacent rooms. This is especially important for many of the use cases in Cerner’s Smart Room solution. Lightning fast response times that Gen 2 IR affords was important to some of our visitors as we were told that their staff and caregivers are often quickly in and out of patient rooms. We were told that many of the locating tags for caregivers and staff are thought to be cumbersome or bulky. The CenTrak staff badge, with thickness of no more than 3 credit cards, is greatly appreciated. Those who were interested in accurately capturing milestones at the bedside (i.e. anesthesiologist arrives at patient bed in pre-op) were impressed with the performance CenTrak has achieved in current installations with its “Virtual Wall™” technology. These devices were thought to be ideal for the other open areas in acute care settings like the ED and PACU. Replacing batteries was a concern for many. Visitors were pleased to learn that the power requirements for our sensors and tags is low, meaning long battery life, as long as 10 years for sensors and as long as 7 years for tags. Many also told us they have no resources for troubleshooting and maintaining another complex wireless technology. They were satisfied to learn that the CenTrak network requires no ongoing calibration and its independence from the other networks used for many critical workflow was a comforting. Most of the visitors we spoke with were interested in the ability for a location network like this to integrate with their existing investments in Cerner applications and others that might make use of location data. They were excited to hear that it not only integrates to the Cerner applications but also other complementary technologies like nurse call and preventative maintenance solutions. We had a lot of fun, made some new friends and were impressed anew with the continued progress that Cerner has made to advance the quality and efficiency of healthcare in 2011. 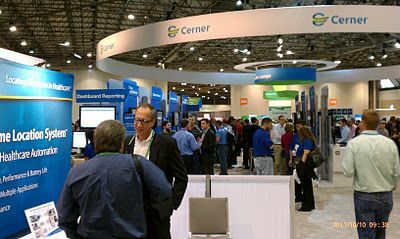 We look forward to following up on all of the conversations we had and to our attendance at the 2012 Cerner Health Conference!